AFP - BAGHDAD (AFP) — An Iraqi television station on Monday demanded the immediate release of one of its journalists who caused a furor when he hurled shoes at visiting US President George W. Bush. 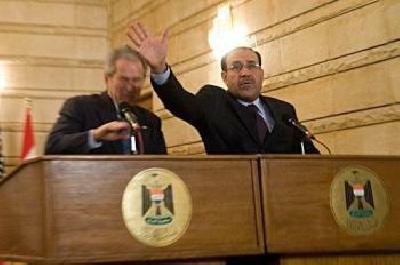 Muntazer al-Zaidi jumped up as Bush was holding a press conference with Iraqi Prime Minister Nuri al-Maliki on Sunday, shouted "It is the farewell kiss, you dog" and threw two shoes at the US leader. Bush ducked and the first shoe hit the American and Iraqi flags behind the two leaders, while the second was off target. Zaidi, a reporter with the Al-Baghdadia channel which broadcasts from Cairo, was immediately wrestled to the ground by security guards and frog marched from the room. "Al-Baghdadia television demands that the Iraqi authorities immediately release their stringer Muntadhar al-Zaidi, in line with the democracy and freedom of expression that the American authorities promised the Iraqi people," it said in a statement. In Cairo, Muzhir al-Khafaji, programming director for the television channel, described Zaidi as a "proud Arab and an open-minded man." "We fear for his safety," he added.